Tim Berndt is a singer / songwriter, musician, recording engineer, photographer, and world traveler... from North Dakota to Taiwan to Monterey, California, and many places in between. The above image is a photograph of Tim taken during his travels. 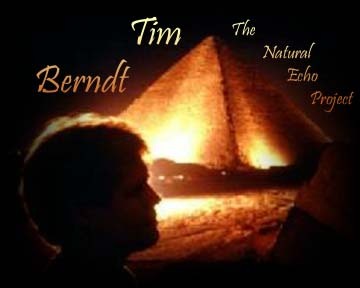 Tim's web site on MP3.com is called Natural Echo Studios, click the link to hear a number of songs from two of his Greatest Hits? CDs: (Vol. 1, Natural Acoustics & Vol. 2, Mostly Rock). Performance credits by Tim include: acoustic & electric guitars, lead & backing vocals, engineering & mixing, and occasional synths, special effects, keyboard bass, & percussion. Many, many other people helped this music creation since 1983. Tim Berndt: "My adventure with these songs has been an extended one, but like Captain Kirk said while dying beneath the twisted metal of that collapsed skywalk on Veridian III, 'It's been fun...'." © 2001-2009 Tim Berndt & Trimordial Studio. All Rights Reserved.